Free Audio Converter 4dots is an audio conversion utility that supports 15 audio formats and 10 video formats. You can convert between audio files or extract the audio from videos (e.g. music videos) and save as a popular audio format. Free, powerful and multilingual audio converter that supports 15 audio formats and 10 video formats. Convert M4A to MP3, AAC to MP3, FLAC to MP3, WAV to MP3 e.t.c. Free download application features.Cut MP3 files and other audio files and also join MP3 files and other audio files. Free download application features.Extract audio from video files (AVI, MP4, MPEG, MPG, MOV, MKV, FLV, WMV, 3GP, VOB, SWF formats). Free download application features.It is absolutely Free and very Easy to use! 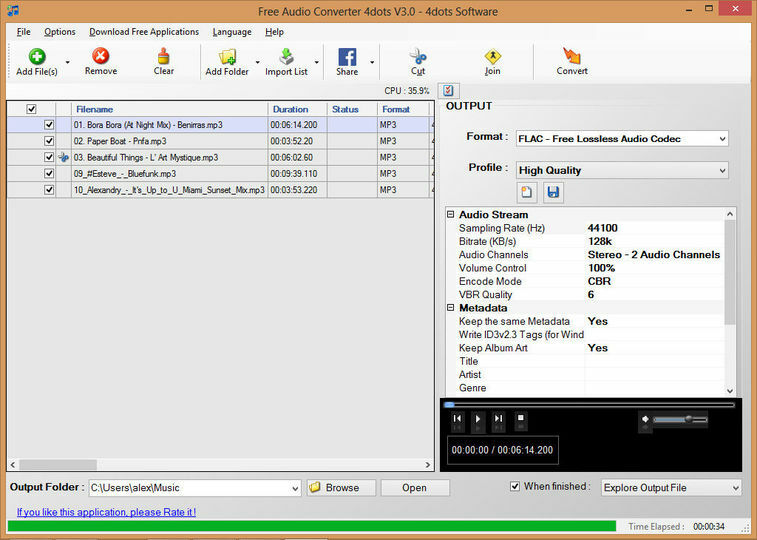 Free download application features.Edit the output profile settings such as bitrate, sampling rate, volume control, encode mode, vbr quality and metadata. Free download application features.Multilingual and translated into 38 different languages.